→Recurve Bow Reviews – Get Your Best Recurve Bow Now! If you’re serious about learning to shoot recurves, you should look into the physics working behind operating one from this harvard.edu page. Now, without further ado, here’s my list of the best recurve bow reviews. This gorgeous take down recurve bow offers the best of traditional shooting with a modern twist. This bow offers a magnesium handle equipped with an innovative Thermal Elite Grip by Martin. This grip dampens vibrations and works well to create a quiet, smooth, and easy shot. Unfortunately, the arrow rest for this bow is made of plastic and is strips rather easily. To get the most out of this bow, you really should get a proper arrow rest and also replace the string fairly early (it will begin unraveling after 200 or so shots). If you like adding accessories to your bow, you should consider adding a bow sight to this bow too. If you want to know our opinion on the best bow accessories, follow this link: Best Bow Accessories. Sure this bow has a small set of problems, but if you can look over those few minor flaws and like customizing your bow, this is one of, if not the best recurve bows on the market. 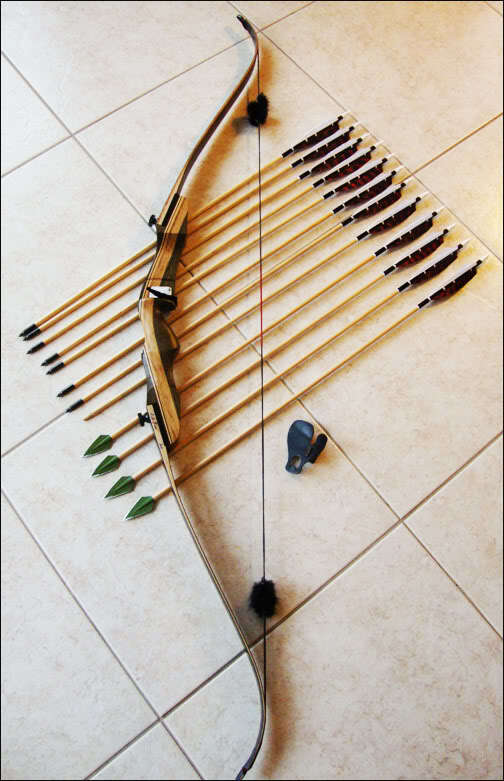 However, if you prefer out of the box functionality, then you should scroll down to the best hunting recurve bow review. I’m sure it won’t disappoint you. This affordable recurve bow, currently available on amazon, allows you to quickly enter into the classic art of archery. Since you’ll probably be a beginner or buying for a beginner, I’d recommend getting the lower pound limbs to start; anywhere between 25 to 35 pounds depending on your size. The reason to do this is because in traditional archery, your form is everything and it’s MUCH easier to learn better form with a lighter limbed recurve bow. You can always buy heavier limbs later either from Samick or another manufacturer once you’ve outgrown the lighter ones. This tends to be the more popular and cheaper option. The draw and release on this bow are smooth and wonderful everytime. The only gripe I have with it is that it’s a little loud in the default configuration. You’ll have to find some way to silence this guy if you want to go hunting. A common thing to do is to add a felt arrow rest and a bow silencer. The bow silencer that you choose is totally up to you. You could always check out our best bow accessories guide for more detailed information. If you intend to go hunting with this bow, be sure to check the laws in your state. Some states only allow you to hunt with bows of 45 pound limbs or more, meaning you’ll have to actually practice with your new bow before going out on the hunt. A fantastic choice for pros and beginners alike. Beginners will enjoy the high brace height, making it easier to learn proper shooting technique and everybody will love the almost nonexistent vibrations. That’s right, the mechanics and design on this takedown recurve bow take vibration out of the aiming equation, allowing you to be focused through 100% of your shots. It’s slim and sturdy riser makes the bow very easy to navigate through the woods making it and exceptional recurve bow for hunting. While a little on the pricey side for beginners, its wide array of intuitive innovations and features still makes a fantastic bow forpractice, competition or hunting. This bow is among the most stable and accurate takedown bows available. It’s very forgiving to beginners and very fast with pros. It also has a detachable grip. I don’t think you’ll want to take it off though as it is very well polished and comfortable. It’s nice when the all the little things come together and form something incredible. This bow is that something incredible. The Hoyt Buffalo was adapted from Hoyt’s best Olympian bow specifically to be re-engineered for hunting. As you can imagine, the result is an absolutely terrific bow, which has gotten it’s recognition in major motion pictures such as “The Hunger Games: Catching Fire”. Its ease of use, reliability, power and accuracy make it a much sought after recurve bow. This bow comes with a slew of items, like most great bows. Among them; handmade Flemish bowstring, bow stringer, silencers, limb covers and a padded bow case. Also a DVD to help you fine tune your bow to your preferences.